Skull base metastases frequently appear in a late stage of various tumor entities and cause pain and neurological disorders which strongly impair patient quality of life. This study retrospectively analyzed fractionated external beam radiotherapy (EBRT) as a palliative treatment approach with special respect to neurological outcome, feasibility and acute toxicity. A total of 30 patients with skull base metastases and cranial nerve disorders underwent EBRT with a mean total dose of 31.6 Gy. Neurological status was assessed before radiotherapy, during radiotherapy and 2 weeks afterwards categorizing orbital, parasellar, middle fossa, jugular foramen and occipital condyle involvement and associated clinical syndromes. Neurological outcome was scored as persistence of symptoms, partial response, good response and complete remission. Treatment-related toxicity and overall survival were assessed. Before EBRT 37 skull base involvement syndromes were determined with 4 patients showing more than 1 syndrome. Of the patients 81.1 % responded to radiotherapy with 10.8 % in complete remission, 48.6 % with good response and 21.6 % with partial response. Grade 1 toxicity of the skin occurred in two patients and grade 1 hematological toxicity in 1 patient under concurrent chemoradiotherapy. Median overall survival was 3.9 months with a median follow-up of 45 months. The use of EBRT for skull base metastases with symptomatic involvement of cranial nerves is marked by good therapeutic success in terms of neurological outcome, high feasibility and low toxicity rates. These findings underline EBRT as the standard therapeutic approach in the palliative setting. Schädelbasismetastasen treten häufig im Spätstadium vieler Tumorentitäten auf und können durch Schmerzen und neurologische Ausfälle die Lebensqualität der Patienten stark beeinträchtigen. 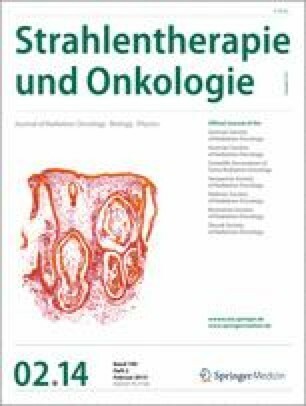 In der vorliegenden Studie wurde retrospektiv eine fraktionierte externe Radiotherapie (EBRT) als palliative Behandlungsmöglichkeit bezüglich der Durchführbarkeit, der Akuttoxizität und des neurologischen Outcomes analysiert. Es wurden 30 Patienten mit Schädelbasismetastasen und Hirnnervenausfällen mit einer mittleren Dosis von 31,6 Gy bestrahlt. Neurologische Symptome wurden vor, während und nach Radiotherapie erfasst. Sie wurden anhand der klinischen Syndrome nach der Lokalisation (mittlere Schädelgrube, Orbital-, Parasellär-, Foramen-jugulare- und Okzipitalkondylenregion) kategorisiert. Das neurologische Outcome wurde in Persistenz der Symptome, partielles Ansprechen, gutes Ansprechen und Komplettremission eingeteilt. Vor Therapie wurden 37 klinische Syndrome diagnostiziert; hierbei wiesen 4 Patienten multiple Syndrome auf. Das Gesamtansprechen betrug 81,1 %, im Einzelnen 10,8 % in Komplettremission, 48,6 % mit gutem und 21,6 % mit partiellem Ansprechen. Zwei Patienten zeigten eine Grad-1-Toxizität der Haut und ein Patient eine Grad-1-Hämatotoxizität unter konkomitanter Chemotherapie. Das mediane Gesamtüberleben betrug 3,9 Monate bei einem medianen Follow-up von 45 Monaten. Die fraktionierte externe Radiotherapie bei Schädelbasismetastasen mit Hirnnervenausfällen zeichnet sich durch gutes neurologisches Ansprechen, exzellente Durchführbarkeit und geringgradige Akuttoxizität aus. Diese Ergebnisse unterstreichen die Stellung von EBRT als Standardtherapie für diese Indikation. L.H. Dröge, T. Hinsche, M. Canis, B. Alt-Epping, C.F. Hess and H.A. Wolff state that there are no conflicts of interest. All studies on humans described in the present manuscript were carried out with the approval of the responsible ethics committee and in accordance with national law and the Helsinki Declaration of 1975 (in its current, revised form). Informed consent was obtained from all patients included in studies. Consent was obtained from all patients identifiable from images or other information within the manuscript. In the case of underage patients, consent was obtained from a parent or legal guardian.